Happy Wednesday everyone! Nick signing on here taking over the blog today. 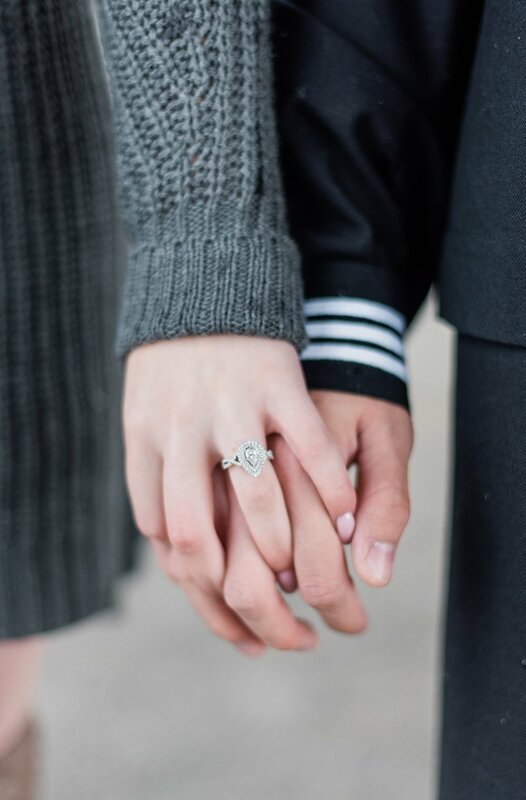 I’m talking all about how I picked Caytie’s ring! I hope I do just as good as Caytie explaining things, she’s better at this part haha. Caytie needed a ring to match her beauty and elegance. The day I got called to leave for boot camp was a stressful day and had me make the decision to propose to her the day I became a United States Sailor. I went to all these places over a week’s time and I didn’t find “the one” until the end of my searching. My last stop was Shane Co and I had thoughts of not being able to get the ring in time since I wasn’t finding the ring that would suit her best. There were so many options and cuts and clarity and by the time I learned all of these characteristics of rings and diamonds I felt as though I was a master at it. Then I began really looking: searched throughout all the Emerald cut diamonds that she swore she would like but I knew she wouldn’t LOVE. The ring I was searching for was one of the first I had looked at when learning the cuts and clarities and all that there is to know about diamonds. I kept gravitating towards a pear shape diamond with a very nice halo and the infinity style branching off the band. Every diamond, every band, every option except the pear seemed to be an immediate no. I asked to see the band I kept going to and I asked for a diamond that would suit the band. Once the lady dropped in the diamond, I knew it was hers. I pictured it on her finger and how perfect it suited her, I saw her tears running down as I’m on my knee asking for her hand in marriage. The people there knew my story and how I was shipping off to boot camp within days and they made magic happen and sized it and cleaned it the very day I left for boot camp. I did have the opportunity to look at it and as I opened that box the well of emotion brought over me that I knew this was the ring for Caytie. I always knew she’d love anything I got her but that was the perfect choice and now she’s grinning from ear to ear whenever anyone mentions it. Plus gotta love the fact you can see it from five tables away as some of her clients say lol. Nick signing off now, I’ll leave this blogging thing to the future wife. Let us know in the comments what other blog posts you want to read! We hope you have a good rest of your week!